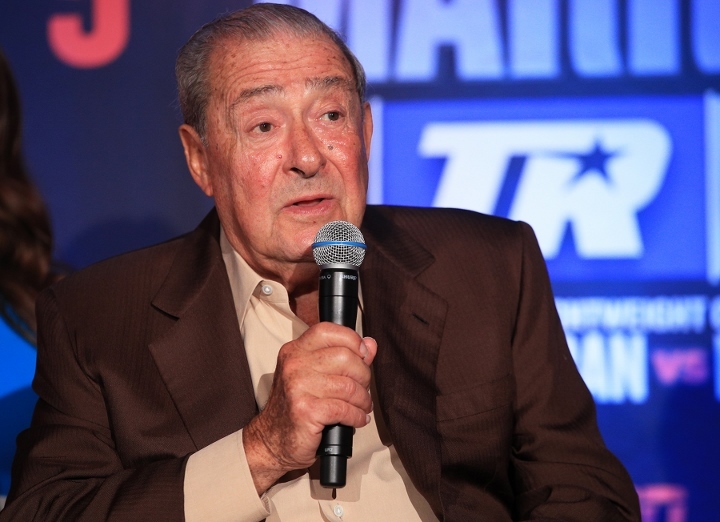 Top Boxing promoters Bob Arum and Oscar De La Hoya have joined a number of others in the boxing world to condemn the Floyd Mayweather vs. Conor McGregor fight as a farce. De La Hoya said that what he saw in the T Mobile Arena in Las Vegas was a shame in all aspects and made a mockery of the sport, as the fight contained no actual boxing. "You can see the video of the fight and it will be verified that it was pathetic," De La Hoya said. "It was simply treated, as we already knew, as a millionaire mockery, that those who watch over the integrity of boxing allowed to happen." This sentiment was echoed by Arum, who was in Las Vegas to sign a contract with ESPN to broadcast fights that will look to re-highlight the importance of boxing. "There is nothing new to be said," Arum added. "We anticipated that this fight would be an unfortunate exhibition, who's only purpose was to deceive fans by putting this type of boxing on the screen." UFC President Dana White has said that he hopes to speak to McGregor very soon about his return to mixed martial arts, and his return is sure to be a success after sharing a ring with Mayweather. "It was a good experience, but I do not even want to imagine that it could be repeated, I do not want to mention that to my fighters," said White. "The event was unique, the two big stars of each sport facing each other, it will probably never happen again..at least I hope not." Arum felt the in-ring showing by both was terrible. "Both gave a regrettable show of boxing, one because he did not know much, much less put in a blow that a child in the boxing gym would know to do, and the other because he did not destroy his opponent in the first round," Arum raged. "It was the most awkward boxing fight in the history of Las Vegas." Despite the criticisms, both boxers were praised in their dressing room doors by famous Hollywood faces, and Mayweather pocketed an immediate $100 million, with the potential for it to rise to as high as $300 million. Tags: Bob Arum Oscar De La Hoya Conor McGregor Mayweather vs. McGregor Floyd Mayweather Jr.
Uncle bob, a half a billion people weren't wrong. A fight they wanted to see old Floyd go out on his shield to a bigger, younger, primed UFC champ who brashly promised to break him in two. Have to agree with Ol'Bob, the bout was a joke.